The photos were taken on December 27, 2013 at 10:58 AM. The "Take it!" Came as I was sitting in my car, waiting for an associate of mine to rejoin me as we progressed through our day. I sometimes listen to NPR and was in a low output frame of mind that one sometimes goes into while waiting. For some reason I started to look at the office building that was across the street which had a rather nondescript wall of windows. I made a slow visual sweep of the wall and found one window with a reflection in it. 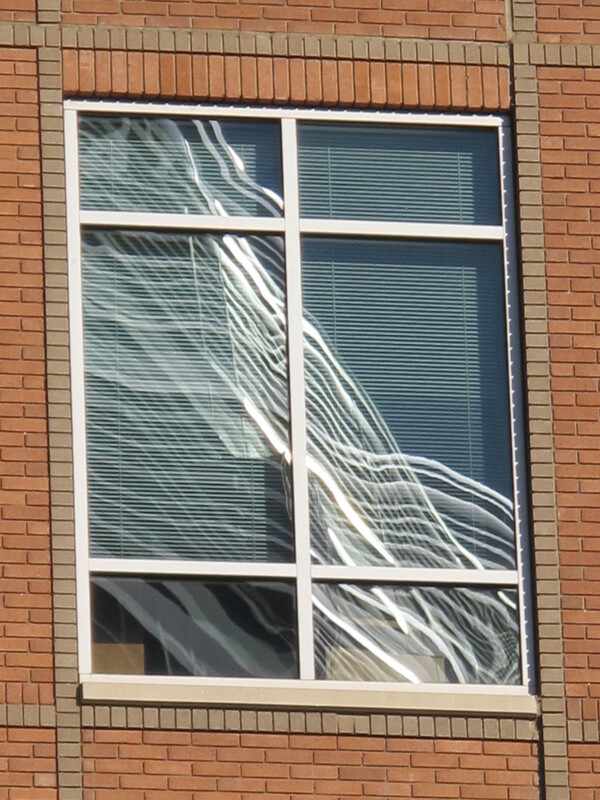 The other windows had blank sky being shown. 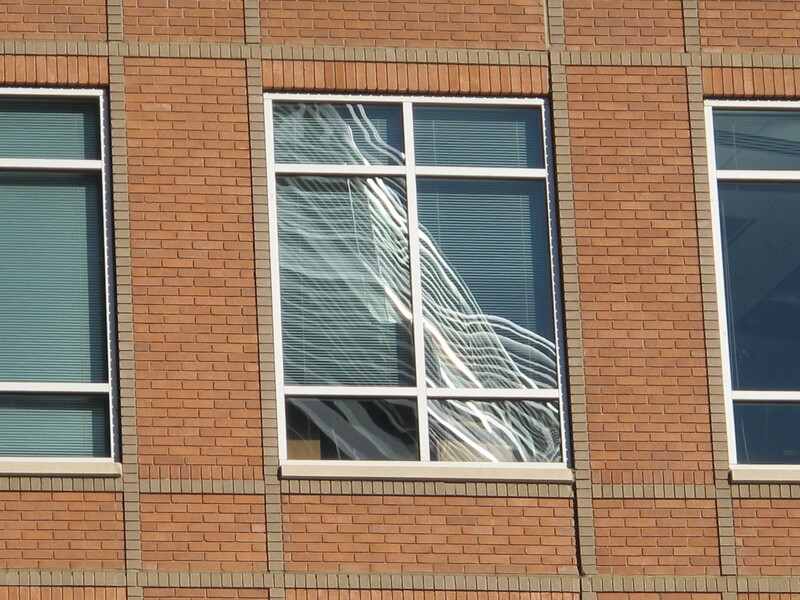 I took a second look at the window with the reflection and grabbed my camera to see if I could zoom in on it. The zoom was a success showing the above image. The picture is eerie in its distorted beauty, showing the building that I was in front of. I took a second shot, backing off a bit to show a little of how alone this one window show was. The After Take: I only have shown the photo to a few. Their reaction was to be as amazed as I was upon first seeing it. They also enjoyed seeing the second photo to gather some context. I am looking more closely at windows for they sometimes have very true reflections and then on other occasions quite distorted both of which can be quite striking. Hope you enjoy this lucky catch as well. Its the doorway into bizarro world. Lol bizarro world, thats funny. The brick layout is really well done. Must be an awesome piece of architecture. You catch some of the coolest shots. I don't have the eye to catch this stuff, or maybe I'm just always in a hurry. Its almost a lesson in itself to "stop and smell the roses."